In this post I share a few tips and insights around occasion speeches and how to approach them. A number of my clients come to me for help with these kinds of speeches and typically, they’re people who don’t make speeches regularly at work. The clients are often slightly freaked out at the thought of having to speak up at an important event like a wedding or a funeral. Watch the video for a more complete discussion but here are a few tips. Except for the case of a funeral where someone is shockingly taken from us without notice, many special occasions are planned months or even years in advance. So don’t leave things until the last minute to prepare. Give yourself time to write and rehearse your speech. It’s quite normal to hate having to practise, but it’s the act of rehearsing and working through your talk that will enable you to relax and enjoy the moment with family, friends or colleagues. If you’ve been asked to make a special occasion speech, chances are you’re a special person! Ha, I mean it. Why did they choose you? Do you have a particularly close relationship with the celebrant, or did you win an award? Clients often say it can be worse speaking in front of friends and family than strangers. If you feel this way, remind yourself of all the people in the room with whom you have great relationships, or why you’re uniquely qualified to get up and make the speech you’re planning. We often put loads of pressure on ourselves when making a speech. We want it to be perfect. We want to be funny like our favourite comedian or full of gravitas like a well-respected politician. Instead of trying to emulate someone else, why not plan to be the best version of you? Make a list of 3 traits and behaviours you demonstrate when you’re at your best. Now think about how you can incorporate these characteristics into your speech. Are you funny, warm and kind? Serious, informative and insightful? Whatever that combination that makes you unique, try and bring it into play by thinking about who you want to be before you write the speech. Of course, balance this with the requirements of the occasion and the needs of the audience, but allow yourself to be YOU on stage. This will get rid of much of your anxiety because now you’re coming from a position of strength rather than weakness. So, a few tips regarding making your next occasion speech. Prepare early, appreciate who you’re with and be your best self. 2 – Buy the book ‘How to be a D.I.V.A. at Public Speaking‘. Previously only available on Amazon, you can now buy it in PDF format direct from my website. 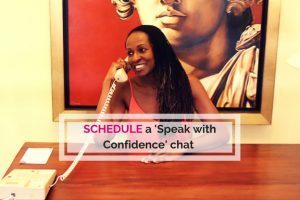 3 – Check out my program for business owners – Get Clients with Speaking. 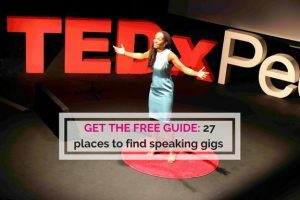 Use this course to become a more accomplished speaker, step up, speak up and grow your business. 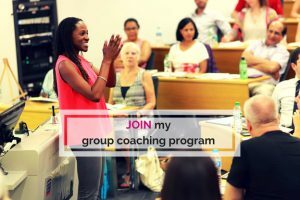 You can take the program as a group course or via private 121 sessions with me.